Trajectory-Based Operations require new technologies, and the perceived investment required for those technologies may, at first, appear to be a hurdle - perhaps an impediment to doing so. This implementation can either be mandated through regulation or by budgeting for and limiting investment costs. 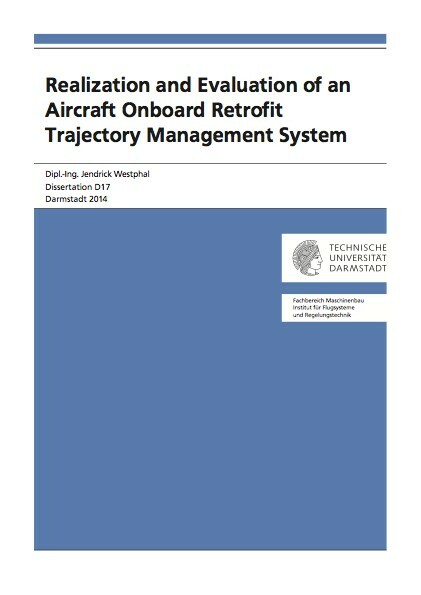 This thesis provides a proof-of-concept for an onboard retrofit Trajectory Management System that enables a cost-efficient implementation resulting potentially in a high equipage rate. For this research, the Trajectory Management System is designed as decision support system for the pilot who is the chief decision maker onboard the aircraft. Cognitive ergonomics were reviewed, determining the best integration of Trajectory-Based Operations into an Electronic Flight Bag charting application to support trajectory negotiation, monitoring, and guidance. The negotiation functionality would permit the exchange of trajectories between all on-ground and aboard-flight stakeholders. Trajectory monitoring would transform the temporal constraint of a waypoint into a longitudinal area along the planned route. Four guidance principles are considered that represent differing integrations of the temporal guidance into the aircraft control loops. Evaluations using flight simulator at TECHNISCHE UNIVERSITÄT DARMSTADT, onboard the 2012 BOEING ecoDemonstrator, and the DEUTSCHES ZENTRUM FÜR LUFT- UND RAUMFAHRT Advanced Technology Research Aircraft, demonstrated the general feasibility of the Trajectory Management System under real world conditions. In the simulator trials, the focus was on the usability of the system. The briefing and monitoring of a trajectory using the charting application was compared to integration into the aircraft Flight Management System. The ecoDemonstrator trials, focusing on an arrival integration of the trajectory, showed that the system is prone to communication failure, which led to an increased initial time deviation from the planned trajectory. In the German flight trials, the applicability of the Trajectory Management System was evaluated. Although the evaluated Trajectory Guidance functions have met the required accuracy, an integration is not recommended because of increased pilot workload. Instead the evaluating pilots found subjective benefits of a Trajectory Management System for the graphical Trajectory Negotiation and Monitoring, possibly with a bidirectional Flight Management System integration.